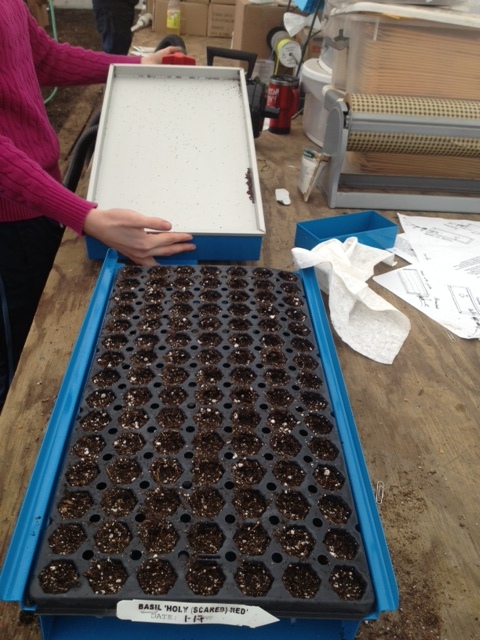 The Growers Exchange greenhouse staff is busy starting all the herb plants needed for our customer’s gardens this spring. Different plants are started by 3 different methods. 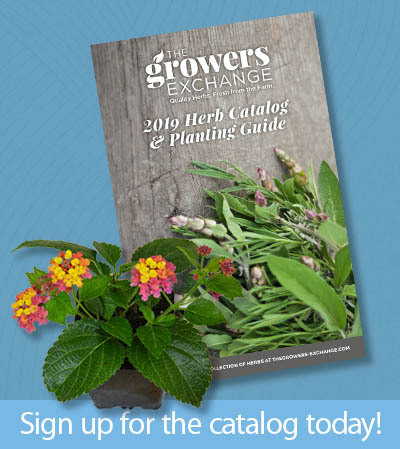 Annual, biennial, and some perennial are easy to grow from seed. Basil, cilantro, arugala are examples of some herbs that grow quickly from seed. Italian parsley is slow, up to 3 weeks to germinate and another 4 weeks to grow to transplant size. This herb takes a long time grow from a seed, but there is no other way to obtain new plants. Anise Hyssop, Catnip, and Bergamot are examples of perennial herb plants that may take several weeks to germinate, but are still considered easy to grow from seed. A germination chamber is used to force seeds to sprout before their designated time; parsley goes from 21 to 5 days in the chamber. Seed flats must be taken out immediately after germination, as seedlings quickly die in the high humidity. Technically germination begins with the emergence of the radical. This is the first little white shoot tip to penetrate the seed shell, then germination is over and seedling growth begins. It doesn’t sound like much, if you think about it; emergence of the radical is one of the magic moments in nature. No one can fully explain or replicate a hard little thing that turns into a plant when water is added. Sowing seeds does leave the mind time to wander. And wonder! Herbs that grow as a shrub, such as rosemary, lavender, and germander could be grown from seed, but would not produce a transplant for 1 or 2 years. To avoid the long seedling stage, Stem cuttings are kept under mist and have a heat source below keeping the root zone warm. The stems soon grow roots and a miniature version of the parent plant is soon ready to transplant. 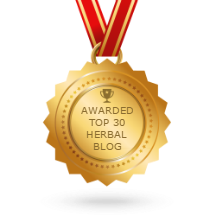 Other herbs such as Costmary defy these methods. Bible leaf plants grow from a rhizome which is divided into new plants by cutting a piece of root with a leaf bud. These divisions also grow a clone of the parent plant. All these herb plants are on a schedule with someone’s garden. We time our plants to be ready for their new home early this spring.